From moose in the Northeast Kingdom to snow geese in the Champlain Valley, here are some of Vermont’s wildlife watching hot spots. There may be no greater trophy for a wildlife-watcher than capturing a photo of a rutting bull moose calling for cows in the autumn mist. The best places to look for moose in Vermont are in the bogs and wetlands of the Northeast Kingdom, particularly at West Mountain, Wenlock, and Victory Basin Wildlife Management Areas, as well as the Conte National Wildlife Refuge. Moose are often spotted at salty bogs along Route 114 between East Burke and Caanan and Route 105 from Island Pond to Bloomfield. There is also a moose viewing platform at the junction of Route 105 and Notch Pond Road in Brunswick. Viewing is best between 5:30 and 9:30 a.m. after a rain in late spring and summer. Moose may also respond to a moose call during the fall rutting period in late October. Keep in mind that moose are large, potentially dangerous animals that can run quickly and may charge when threatened, particularly a cow with calves or a rutting bull. Every fall, visitors to Dead Creek Wildlife Management Area get to witness one of the most magnificent gatherings of wildlife in North America – the famous snow goose and Canada goose migration. The geese turn the sky gray and white during their remarkable 5,000-mile journey from the Arctic tundra to the American South. While their numbers have fluctuated in recent years, the geese still flock by the thousands, taking over the wetlands and cornfields around Dead Creek to rest and refuel. The geese are best viewed flying around and feeding during the first hours after sunrise and the last hours before sunset at the viewing area at the viewing area along Route 17. The northward march of spring sparks the arrival of the geese at Dead Creek, usually between early March and late April. During the fall, they are usually around from early October into mid-November. Champlain Valley WMA Checklist - Download this list of birds, mammals, amphibians and reptiles you might see while exploring the WMAs in the Champlain Valley. 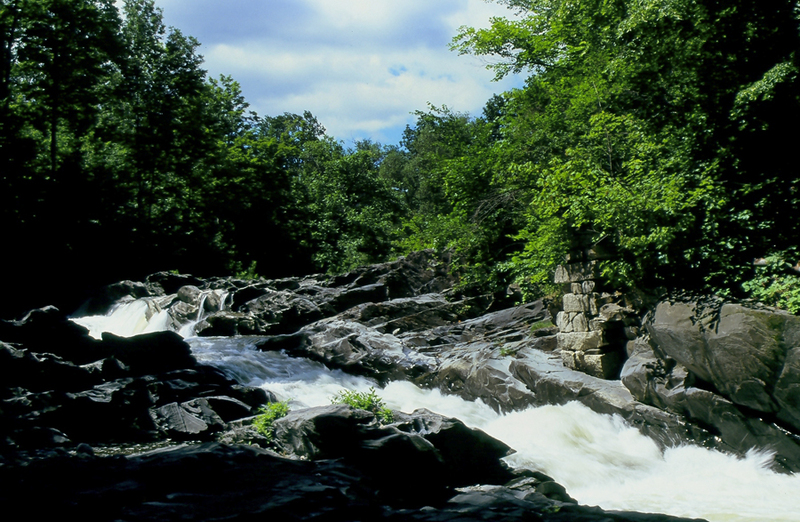 Each spring, steelhead rainbow trout begin their arduous expedition up the Northeast Kingdom’s Willoughby River and run into Willoughby Falls, a rocky cascade near downtown Orleans. The pools in the cascade become overrun with large adult steelhead that occasionally leave the water and take to the air as they attempt to leap over fast areas of current in the falls. These aerial displays offer lucky viewers the opportunity to see these beautiful, powerful fish up close. The extraordinary spectacle happens quickly, typically in mornings in late April to early May, and is usually over in less than 10 days. The warmer temperatures and greater flow sparks the arrival of the fish at the falls, but the times of year this occurs varies from year to year, check this website often for updates. No harbinger of spring is more distinctive than the sound of the birds singing in the forest. Whether it’s the flute-like song of our state bird, the hermit thrush, or the old familiar notes of a robin, the forests and fields of Vermont become awash with music each spring. For amateur birders, the best place to start the search for birds is by joining a group bird-watch through their local Audubon chapter. As an aspiring birder, you can also just head out into your own backyard with a good pair of binoculars, using online resources to prep for your trip and to help identify birds by sight and by song. Any forested area from late-April through early-June is likely to have birds singing in the early morning hours before 10 am. The areas along Lake Champlain can be particularly good for spring songbirds, and can be accessed via several Vermont State Parks. Hawks are well known for their incredible eyesight, but a good pair of binoculars or even a spotting scope can level the playing field for birdwatchers when scanning for incoming raptors. Vermont’s diverse wild populations ensure birdwatchers may see just about every type of hawk , owl and eagle in the region, which can start as just a distant speck on the horizon before whizzing overhead and streaking away again into the distance. One especially good place to view hawks is Mt. Philo State Park located in Charlotte in the western part of Vermont. A short hike up to the 968-foot summit gives a broad view of the Champlain Valley and the Adirondacks in the distance. The hawk migration starts in September and runs through November, particularly on clear, warm autumn days. There are usually a few experienced birders out there on days when the birding is good who are happy to help a newcomer. Haunting, eerie and unforgettable, the call of the loon may be the quintessential sound of Vermont’s waters. While it’s relatively common now, not too long ago these waters were silent, as loons were on the brink of becoming extinct in the Green Mountain State. Fortunately loon populations have started to rebound, but the recovery has been slow due in part to disturbances from wildlife watchers. Boaters should appreciate loons from a distance when loons are on the nest or swimming with chicks. Even adult loons can abandon feeding when boaters get too close. A good rule of thumb is if a loon changes its behavior, actively swims away, or rises up and flaps its wings, boaters should move away quickly and quietly. Loon locations vary from year to year, but any large Vermont pond surrounded by wilderness is likely to have loons calling during the summer months, particularly just after sunrise and before sunset. The department also partners with The Vermont Center for Ecostudies to help volunteers track loons each year. Dead Creek in the western part of the state is a paradise for birders looking to spot birds of all types – marshbirds, shorebirds, hawks, owls, woodpeckers, and songbirds all frequent the area. But the ducks and geese truly capture the attention of birders at Dead Creek. From the exquisitely colored plumage of the wood duck, to the elusive flashes of color on mallards and teal, to the deep shading of ring-necked ducks and hooded mergansers, Dead Creek’s waterfowl display spectacular colors. The birds arrive at Dead Creek Wildlife Management Area with the spring, from late-March to late-April. In the fall, the best bird-watching for waterfowl is from mid-September to mid-November. The best places to view waterfowl in the ponds next to the Route 17 viewing area and from Brilyea Road along the refuge, where ducks swim among the cattails and rest on logs. And like all birding, after sunrise and before sunset are the best times to go. The 6,729-acre Missisquoi National Wildlife Refuge at the mouth of the Missisquoi River on northeastern Lake Champlain is truly a wildlife-viewing treasure. In fact, the Ramsar Convention on Wetlands recognized the Missisquoi as a wetland of international importance in 2014. And after a short trip down the Missisquoi, it’s easy to see why the refuge is so special. Paddlers will likely see a variety of wildlife including herons, wood ducks, red-winged blackbirds, beaver, and otters and may even catch a glimpse of a bugling moose or a rare spiny softshell turtle. The refuge also hosts an incredible diversity of habitats, including bogs and floodplain forests. The best way to see the refuge is by boat, starting at Louie’s Landing on the Missisquoi River along Route 78. Check in at the refuge visitor center or online for seasonal closures enacted to protect sensitive nesting sites. On seasonally warm, foggy, rainy spring nights, the calls of frogs can be nearly deafening in Vermont. The spring peepers enter with their soprano notes and are quickly joined by gray treefrogs on alto, wood frogs on tenor, green frogs on baritone, and eventually by the summer bass notes of bull frogs. Frogs start chorusing each year on the first moist spring nights that hover close to 40 degrees, which usually occurs in late March to early April. Due to the number of frogs and salamanders run over by cars during the breeding season, amphibian-watching is best done on foot. Wander around your neighborhood or head into some local woods with a flashlight and seek out ponds, wetlands and other low-lying areas that frogs congregate to get a front-row seat at the show. To find a vernal pool near you, use the ANR Natural Resource Atlas. To help identify the frogs and toads you hear, see the US Geological Survey page. The Christmas bird count is a tradition of censuring birds throughout North America in their wintering locations. The tradition grew out of the 19th century practice of holding bird-killing contests on Christmas Day that morphed in 1900 into a bird-watching endeavor that is now critical for researchers looking to track of bird numbers and locations for conservation. The Christmas bird count is a bit of a misnomer, as groups actually set out to count birds between early December and early January. Audubon Vermont hosts the annual count and times and locations can be found on their website in early December. The groups welcome birders of all ability levels, from beginners to pros. Volunteer and you’ll have a chance to contribute to this very important survey and meet some interesting birders along the way.